Today’s recipe is the celebration of that wonderful little white oval, the egg. Plus, May is National Egg Month so we need an egg recipe! The egg is such a versatile tool in any cook’s apron because it can be the star of the dish or bring a velvety smooth note to accent another main course. It can be whipped up into sauces or used as wash to add color to baked goods. I certainly do not know what came first, the chicken or the egg, but I am just glad the egg came at all. Start by putting a pan over medium heat on the stove at which point add your olive oil and allow it to heat up. Once your olive oil is heated through add your diced shallot and allow them to become translucent but not burn (about 2 minutes). Once your shallot is translucent add your diced garlic and salt and pepper, allow this cook for another two minutes until the garlic is nicely browned. At this point add your mushrooms and tomatoes and allow those to cook for 3-4 minutes. After which you will want to add your spinach and use a pair of silicone tongs to fold the spinach into the existing ingredients. Once the spinach has wilted down form the vegetable mixture into the middle of the pan and add your cheese and allow it melt for about 1-1 1/2 minutes. Once your cheese is melted into the vegetables pour your egg whites over the top and allow it trickle down and in between the vegetables. I allow it to cook for about 30 seconds and I add my basil. Let this cook for 2-3 minutes, I like to drop the heat in between medium and low and cover my eggs at this point to allow them to fluff up and not burn. It is up to you how long you want to cook your eggs, if you like a loose omelet take it off the heat sooner than later, unless you like a stiff omelet and allow it to go on the heat a little longer. 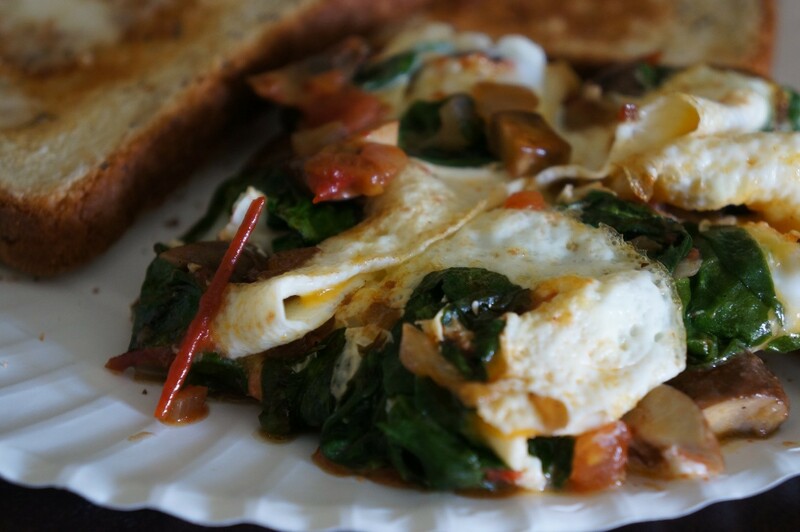 I really like the addition of the basil at the end because it gives this omelet and real earthy flavor with pairs nicely with the mushroom. I would typically add a piece of whole wheat toast or a link of roasted chicken sausage. For more recipes celebrating the egg go to Fill Your Plate’s recipe section and Happy National Egg Month! This entry was posted in Eggs, Food, Healthy Eating, Recipes and tagged Breakfast, Easy, Egg, food, Healthy, Morning, Protein. Bookmark the permalink.